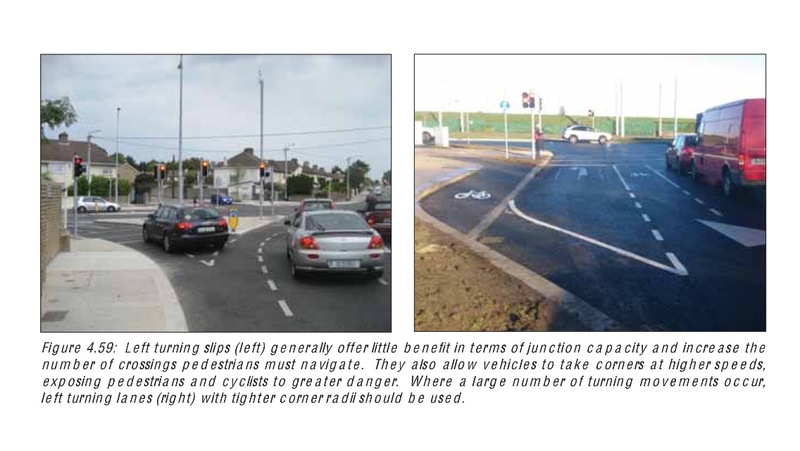 Dún Laoghaire-Rathdown County Council continues to ignore safety and sustainable transport promotion advice in the National Cycle Manual and the Design Manual for Urban Roads and Streets. The latest projects which ignore the design manual include a redesign of N11 junction with Johnstown Road at Cabinteely (construction due to commence in May 2016), the scene of a pedestrian fatality last week, and Wyattville Road Pedestrian and Cycle Scheme (at public consultation until June 1, 2016). While the Design Manual for Urban Roads and Streets may not cover the section of the N11 mentioned above as it has a 80km/h speed limit, it does cover the Wyattville Road scheme (60km/h) and the National Cycle Manual covers all speeds and areas within the Greater Dublin Area. The Design Manual for Urban Roads and Streets states: “Omit left turn slips, which generally provide little extra effective vehicular capacity but are highly disruptive for pedestrians and cyclists. Where demand warrants, they may be replaced with left tuning lanes with tighter corner radii” and “Omit staggered crossings in favour of direct/single phase crossings” — yet the projects includes both left turn slips and staggered crossings. The manual also states “Guardrails can create a hazard for cyclists, reduce footpath widths and give rise to feelings of constraint and restriction to pedestrians”, but these are also used in the draft N11 design. I followed the links above to the DLR website. There is very little information available, just a couple of maps. The Public Consultation Report only has 6 pages out of what appears to be 150 pages. I have emailed to try and get more info.